BELLEVILLE – Prominent Conservatives are criticizing Canada’s public broadcaster. “The CBC doesn’t need to be reformed, it needs to be dismantled,” federal Conservative leadership candidate Kellie Leitch said in a tweet last week. Hers is the most extreme of a number of recent proposals from Conservatives suggesting that the CBC is in need of serious changes. Being in direct competition for advertising revenue with private broadcasters while also accepting government subsidies is seen as an unfair advantage by some. But others say that a publicly funded broadcaster serves an important role in providing largely unbiased news coverage and Canadian content. The CBC recently published said it would need $400 million in additional funding to continue its operation without the luxury of ad-related revenue. The $400 million would cover loss of ad revenue ($253 million) plus the expense of producing additional Canadian content ($105 million). 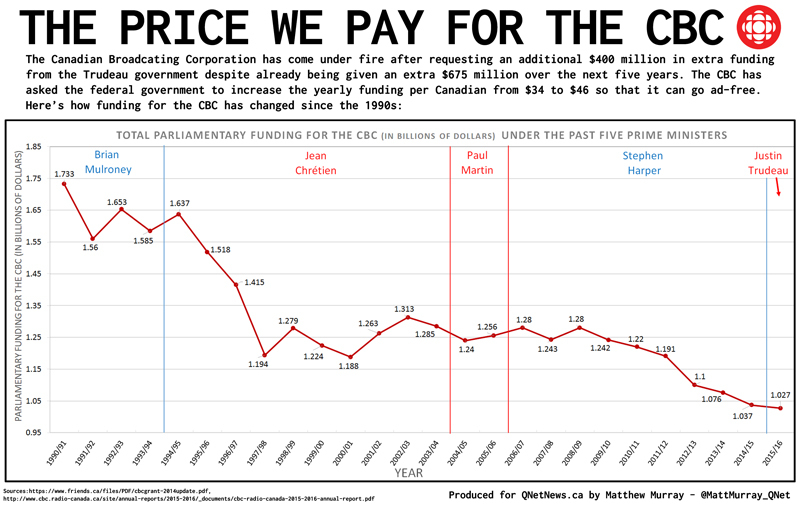 If the CBC’s requests were granted, total government funding would work out to $46 in taxes per Canadian per year, up from $34 currently. That increase is something a retired teacher here in Belleville says wouldn’t bother him all that much. He frequently relies on CBC broadcasting for his national news, he said, adding that he would be “more than happy to pay the few extra dollars” to keep the CBC in operation as Canada’s public broadcaster. The notion of a “steady as she goes” approach to the CBC’s future is one shared by many in the social-media world as well. Conservatives feel it's unfair for the CBC to compete in the private media market. 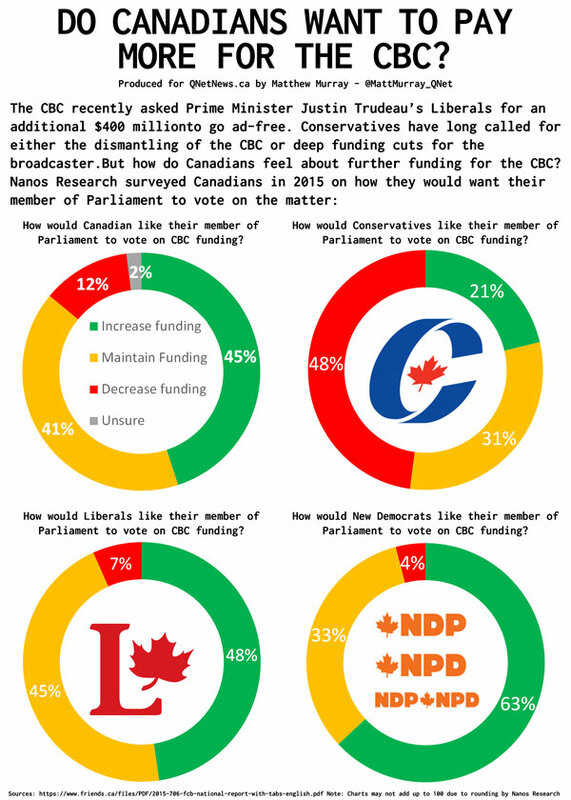 Should the federal government continue to fund the CBC? According Heather Conway, the CBC’s executive vice-president of English services, the network’s funding ranks third lowest among 18 comparable countries. Only New Zealand and the U.S. grant fewer tax dollars to public broadcasters, she has pointed out.